The following history is extracted from the National Register history dated 1982. The Flemington Church and Flemington Society is informally known as one of the “three daughters” of the Midway Society, Midway, Georgia, Because malaria was prevalent in the low swamp lands in the Midway Section, the plantation owners began establishing summer homes in what they termed the pine-lands. These little summer villages were called “Retreats”. In 1815 Mr, William Fleming wishing to establish a summer home and at the same time enjoy the society of his friends, surveyed a tract of vacant land and laid out lots. After selecting one for himself, he gave the remainder to some of his friends, thereby establishing a retreat known as Gravel Hill. By the 1850’s the settlement had become more permanent and was renamed Flemington for its founder. It was during this time that the present meeting house was completed in 1853. The exact date of the organization of the church and Society of Gravel Hill is not known. The earliest record found to date is the Record Book of the Church and Society of Gravel Hill, a small bound volume containing minutes of the annual meetings and other data. The first entry is “subscription for building the Church on Gravel Hill” 1832. Four acres of land were given by Simon Fraser, A frame building was constructed and used for twenty years. The organization was patterned after the Midway Church and Society. Members attended services at Midway monthly or as often as possible. 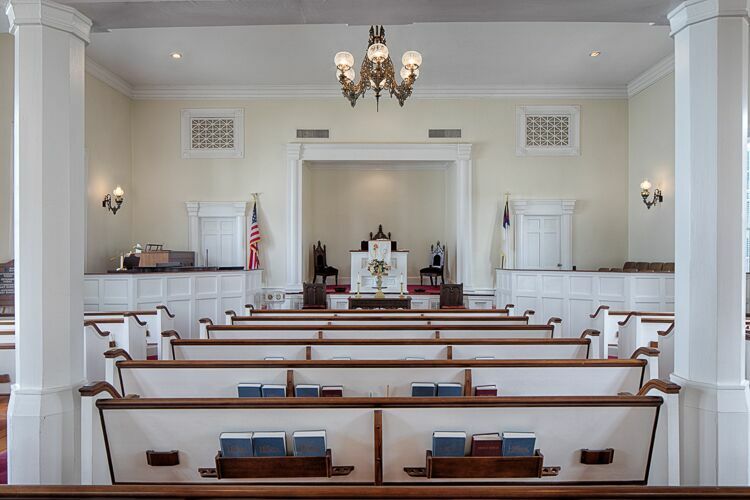 Originally organized after 1815 as a Congregationalist Church, it became Presbyterian in 1866 after the congregation suffered through the Civil War and decided to no longer be associated with the Midway Society ten miles away. The changing of faiths of a congregation is quite unusual, especially in the Deep South and after being in existence for nearly half a century. Congregationalists were a rare faith in Georgia, where as Presbyterians were a more well-known faith even if only the third most populous and then less than 10% of the religious population in Georgia. 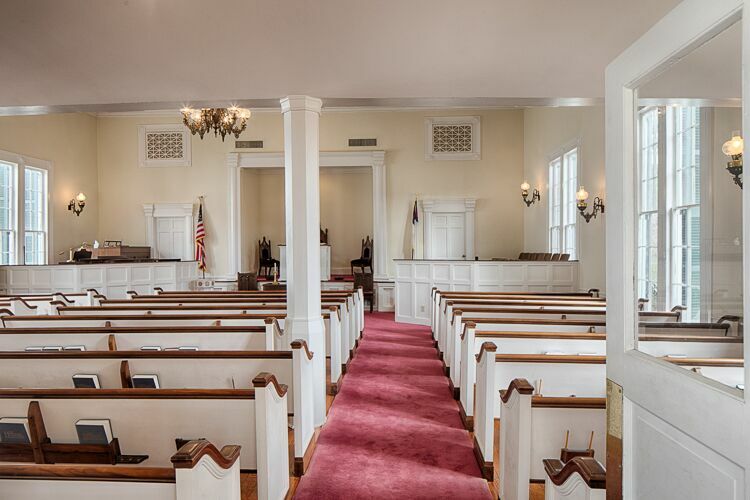 As you will see from the photos below, Flemington Presbyterian is a wonderful example of historic preservation,and the love of the congregations over the years that have passed it along from one generation to another. She is a very significant contribution to our coastal Georgia history. We are so grateful for this gift. To read the complete National Register history document, click here. For additional history regarding the church click here. As you saw in the opening photograph, Flemington Presbyterian is, as stated in its National Register application, “… a magnificent example of Greek Revival architecture with Gothic Revival influences, as adapted for a religious structure.” This church is truly “special”. 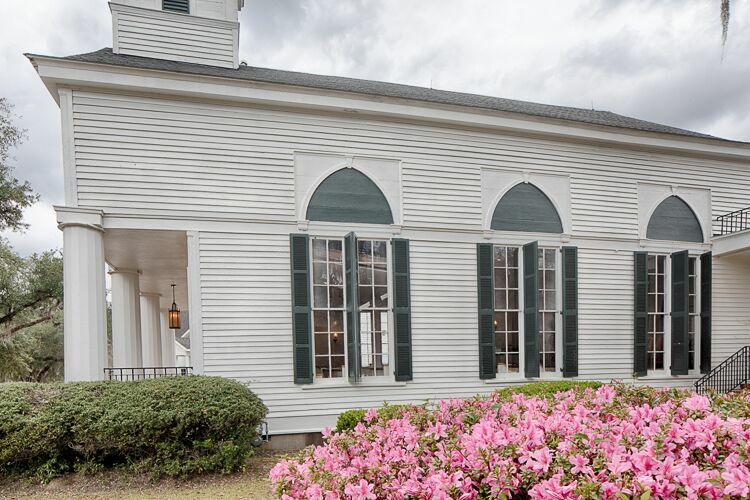 This close up of its striking portico (front steps and flooring replaced with brick in the 1950’s) and its massive heart pine columns (still standing after over150 years) reflect the highest quality materials and workmanship that could be afforded only by the wealthy planters that settled in this area of Georgia before, during and after the Revolutionary War. This view is of the southeast side of the sanctuary and its beautiful large windows. These windows reflect the Gothic Revival influence. They are original to the structure, grouped in twos and married by a non-functional, elliptical arch “cap”. We are told that, remarkably, only a few of their clear glass panes have been replaced over the years. Further evidence of the continuous repair and maintenance at Flemington is provided by the fact that the Louvered shutters are original… as is the associated hardware. This is a photo from beneath the gallery toward the chancel pulpit and apse. 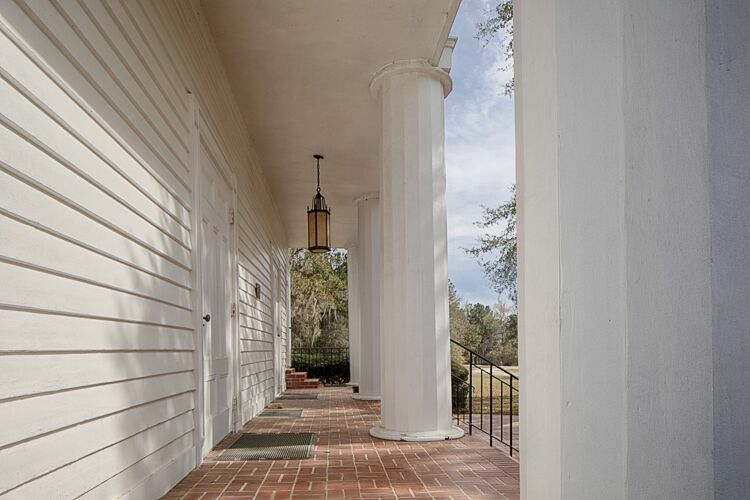 Lovely, chamfered gallery columns are seen on each side and shaped in ways similar to those on the portico. Notice the simplicity and clean lines within this sanctuary. White and cream paint covers most flat surfaces and generate a calm and worshipful environment. 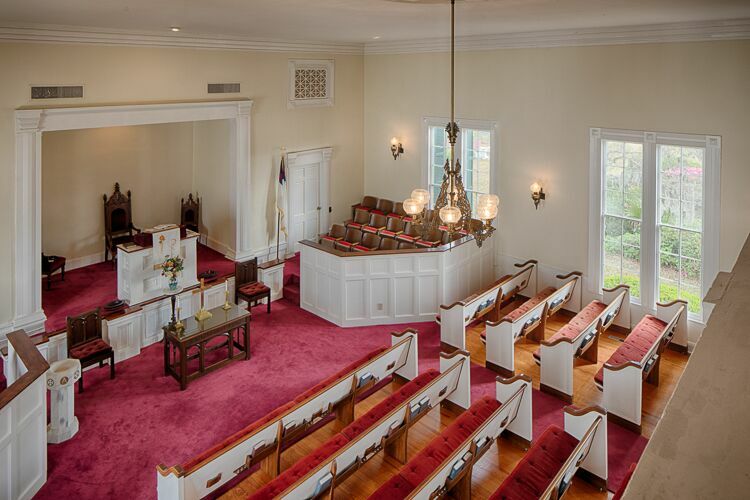 In this photo from the southeast wall, we see the two front doors and two aisles with pews on either side creating three sets of pews. Though aisle carpeting is now in place, we can get a glimpse of the heart pine flooring still in place in the sanctuary. In this view toward the rear of the church, we get a complete view of the gallery. This gallery was originally for use by slaves and after the Civil War by freed men. It remains in its original state but is seldom used. Please note that the gallery is bowed, lower on the left and right, higher in the middle. We are told that this design, like the foredeck of a ship, was implemented to increase the structural strength of the building. Since the original structure was designed by T.Q. Casssels, a general contractor and ship builder, that explanation is quite plausible. This photo was taken from the gallery. On the left and right of the chancel and pulpit we see two small choir lofts. Looking past the pulpit and into the apse, we see three 19th century chairs reputed to be authentic and part of the original church furniture. Behind the pulpit are an office and a choir room which can be reached through the two doors seen flanking the chancel. The lighting within the Flemington sanctuary has always been by an oil burning central chandelier and wall bracket sconces placed throughout the interior. In a remarkable example of continuity and authenticity, the chandelier and bracket lamps you see here, and have viewed in many of the earlier photos, are original! The original fixtures were later adapted for electrical wiring. This is an extraordinary example of outstanding stewardship by the Flemington Congregations through the ages. 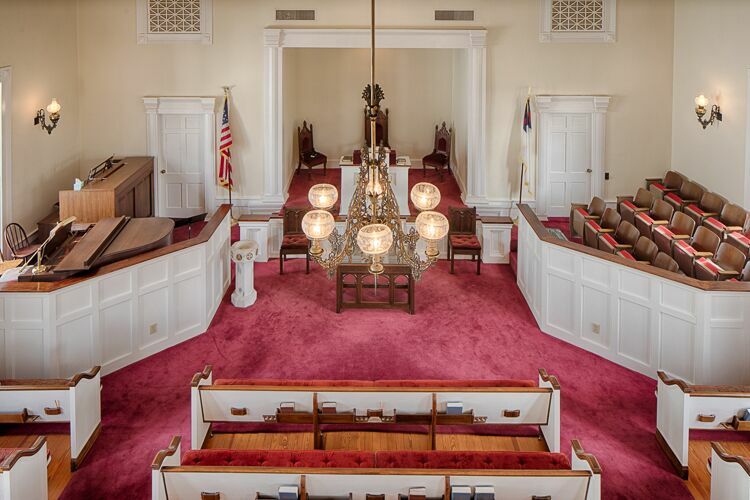 Here is a final look at the sanctuary showing off the 150+ year old lighting fixtures. 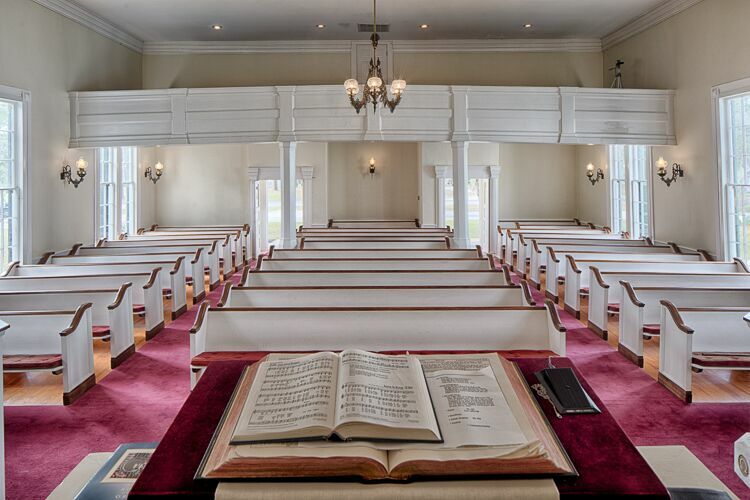 The huge, clear glass pane windows coupled with the big illumination boost from these electric lights brightens the sanctuary and welcomes congregants and visitors today and will for decades to come. Walter Leroy Cassells was born February 5, 1889 in Flemington, Georgia. At the age of 28 he registered for the draft. His registration card shows he was employed by Ford Motor Company in Atlanta in the stock department. His World War I service card shows he was inducted on June 26, 1918. He departed from Hoboken, New Jersey on October 27, 1918 aboard the ship LEVIATHAN. He left Bordeaux, France aboard the ship SIBONEY on April 18, 1919 and arrived in Hoboken, New Jersey April 27, 1919. He was listed as sick and wounded from USA Base Hospital #216. He was honorably discharged on May 15, 1919. He was a private in Company H, 28th Infantry. The 1940 census shows him a patient at the VA Hospital in Augusta. He died September 5, 1944. Thomas Quarterman Cassels 1808-1879 was the architect for the church. He was a general contractor and a ship builder and was on the building committee when the 1853 church was built. 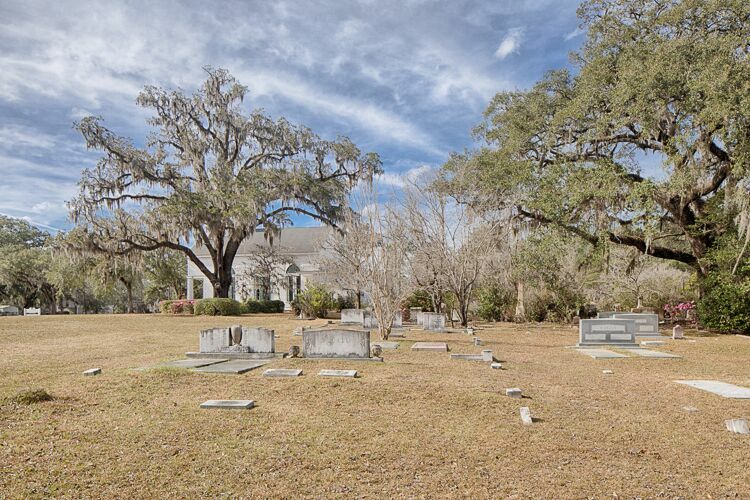 Many early Georgia settlers are buried in the large and beautiful cemetery. Thomas Quarterman Cassels (1808-1879) was the architect for the church. He was a general contractor and a ship builder and was on the building committee when the 1853 church was built. 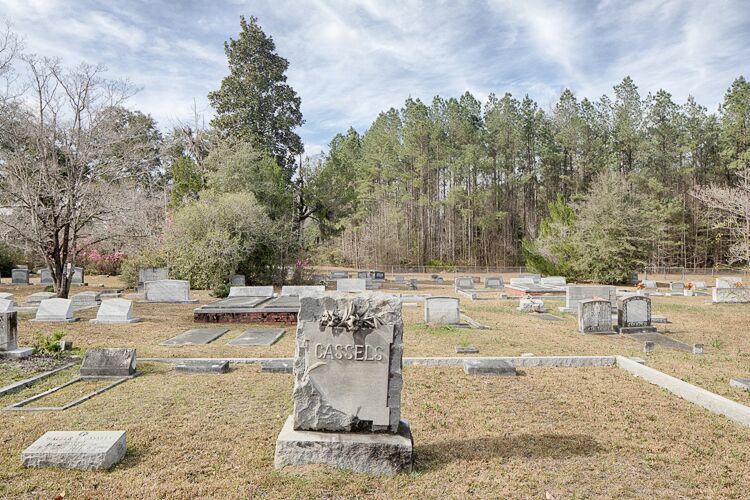 William Augustus Fleming (1830-1904) and his wife Addie Oatman Fleming (1843-1914) are buried there. He ran a country store and was postmaster in Liberty County. The town of Flemington was named for him. Simon Fraser 1787-1836 donated the land for the church and cemetery. Henry Bascom Smith was born February 1, 1857. He died February 8, 1880. Since he died so young he only shows up in census records as a child. His father, Joshua Smith, 1795-1875, left a will in Bryan County, Georgia. He owned a large estate which he left to his wife, Ann Eliza Frazier, two sons by his first marriage, and his son Henry Bascom Smith by his wife Ann Eliza. 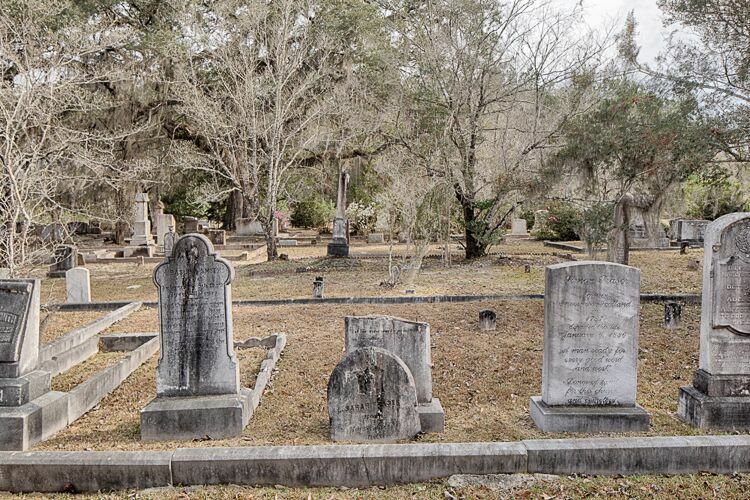 Joshua Smith’s obituary appeared in a Savannah newspaper on December 10, 1875. 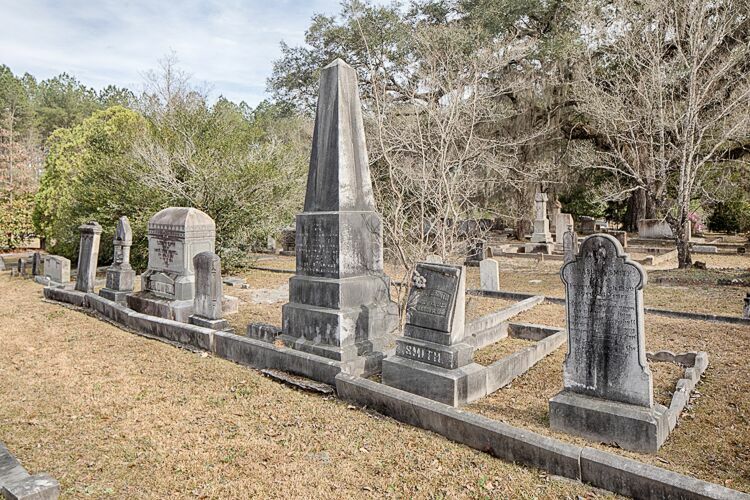 It described his residence as being on the Ogeechee River and stated he had been a member of the M. E. Church South for more than fifty years. 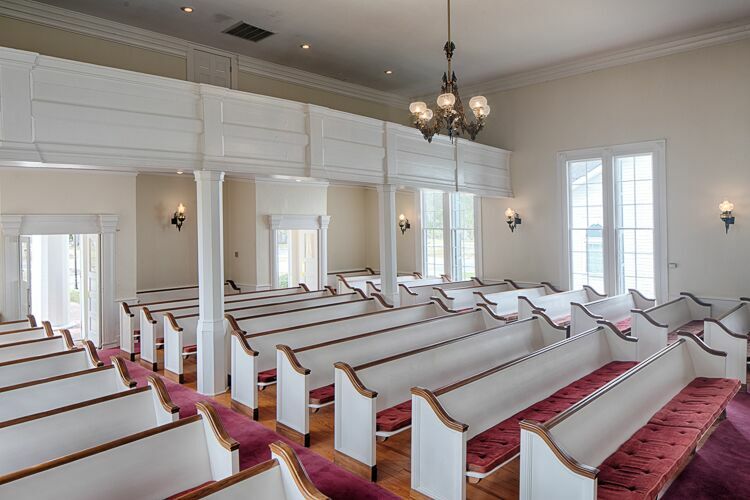 We think Flemington Presbyterian represents a great blend of up to date conveniences and additional structures that have allowed her to grow and prosper, but still preserve the timeless essence of her heritage and her history. Long may she reign. This is an absolute jewel!